Italian cuisine is famous for its pasta through pasta (macaroni, spaghetti), cooked with various ingredients to sauces that can be changed after your own taste. When you cook pasta do you need fixed measurements and accurate recipes, you can improvise depending on what you find through the fridge. Today we prepare a recipe in pasta and cook them in the sauce, not a simple recipe easy to execute. Heed them the oil in a large skillet over medium-high heat. Add onion and cook 3 toccata-5 minutes or until tender. Add tomatoes with juice from preserved everything, water, tomato sauce, pasta (uncooked) and garlic salt. When it starts to boil the Pan cover and reduce to low temperature Grill plate and cook about 12 minutes or until pasta is almost tender. Add spinach leaves that you've washed well beforehand, placing himself above them with pasta mixture. 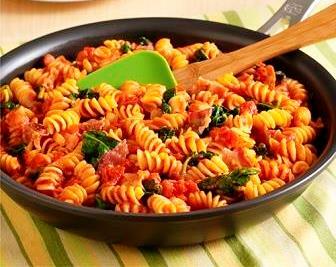 Cover the Pan and cook 2-3 minutes or until spinach is tender and pasta are tender. Add Bacon cut in slices and mix well to combine all ingredients. Serve hot with parmesan cheese preparation sprinkled on top.